We've brought you news about nurseries getting paranoid when it comes to protecting their little charges, but how about this for a reversal - Bromley residents don't want a nursery near them because it might attract PAEDOS. The News Shopper reports that Sunnyfields Day Nurseries's application to turn a house in Pickhurst Park into a nursery has prompted 30 objections to the council and a petition of 140 signatures, mainly concerned with traffic, parking and increased noise. But when one mother happened to mention a worry that "paedophiles will be attracted to the area to be close to the nursery", with a couple in their sixties musing "there are flats overlooking and people could move in there and watch the children. It is a possibility it could happen" (as we muse: they don't seem that bothered about it. Is there a 'possibility' someone has suggested the scenario to them? 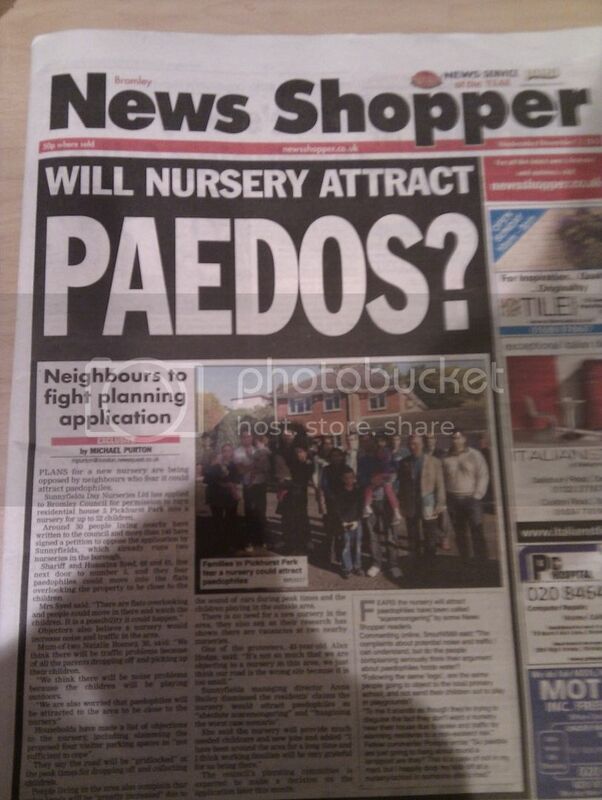 ), the local issue of the News Shopper took it as a cue to start yelling about PAEDOS. We believe the photo of this week's News Shopper is courtesy of Matt Sawyer, but if anyone knows differently please let us know.